This t-shirt shows a steaming mug of coffee a drink that many of us can’t live without specially when we wake up. And the steam of this hot coffee is shaped like a heart so it is like the mug is saying “I Love Coffee”. 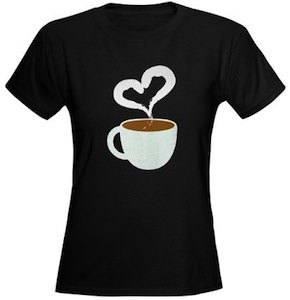 And this this fun coffee t-shirt comes in all kind of styles, colors and sizes so that it will fit any coffee fan.